Introducing the new bizhub C253. These high-performance, compact colour MFPs make your work place more collaborative, more productive and more connected. From the 8.5-inch WVGA colour LCD panel to the vertical Tandem Engine that helps produce high-speed, high-quality colour output, you can rest assured that bizhub has the cutting-edge technologies necessary to make your ideas stand out. Scanning features include the ability to simultaneously scan and send data to multiple destinations with a single operation. With Konica Minolta bizhubC253 you can scan to e-mail, FTP Web DAV, SMB, Box and USB memory, or you can perform a TWAIN scan. Plus, the Compact PDF feature is perfect for converting large, colour scans into files that are easier to send and receive. In addition, new fax functions utilise network infrastructure to move information faster and to provide cost reductions. Besides our standard G3 fax, these machines boast Internet, Colour IP and PC fax functions as well as the handy TSI Routing feature. To make the most of your valuable time, the C253 deliver high-speed, high-quality output, network printing and a host of other features the help your work look its best. In addition to the swift 35ppm/25ppm/20ppm (colour/B&W) print speeds, these machines also feature several productivity enhancements that combine fine image control, thick paper compatibility for all trays, increased paper capacity, a shorter warm-up time and 100% duplexing productivity. Plus, with Konica Minolta’s optional finishers, you can create manuals, direct mail pieces, posters, banners or formal proposals without ever having to send materials out to a printer. Whether in black & white or in colour, these MFPs help you get your work done quickly and creatively?on time, every time. The C253 also boast numerous management and security features to boost efficiency and protect your knowledge capital. The Box function makes it easy to store and share information assets, and a department management feature helps you manage your costs by controlling bizhub use by department. And with User Authentication, Biometric Finger Vein Authentication and non-contact IC Card Authentication, sensitive information and documents stay secure. These bizhubs truly help you maintain your company´s bottom line. The minimalist black and white design ensures that information is easy to find and convenient to access, and that user interfaces are intuitive to use. The colour, 8.5-inch LCD control panel boasts an 800 × 480 pixel, touch-screen display, and the ability to enlarge text. For easier file viewing and selection, the display provides colour previews and thumbnails. Plus, this C253 bizhub features front access to toner and paper, easy-grip paper trays and a vertically and horizontally tilting control panel to accommodate anyone regardless of size, age, gender or disability. 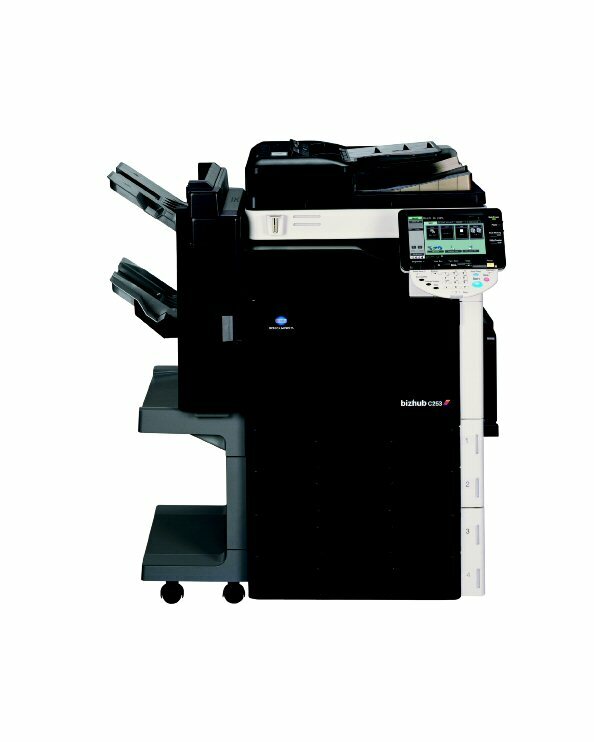 The Konica Minolta bizhub C253 can handle the demands of mid-sized workgroups or branches with a generous monthly duty cycle of 75,000 impressions. You will not be slowed down with the brisk printing speeds of 25 ppm in both B&W and color. First copy time is also prompt at 7.7 seconds in B&W and 11.7 seconds in color. The bizhub C-253 has a standard paper capacity of 1,150 sheets and is capable of using heavy stock. Standard automatic duplexing helps you to save on paper costs and cut down on filing space. The large color touch screen makes this machine easy to use; a thumbnail preview on this screen is also offered. There are four toners needed for the Konica Minolta bizhub C253. Each toner will yield approximately 19,000 pages at 5 percent coverage in cyan (TN-213C), magenta (TN-213M), and yellow (TN-213Y); the black toner (TN-213K) will yield an estimated 24,500 pages at 5 percent coverage. You can choose from the genuine Konica Minolta brand or Precision compatible.